x, 269 leaves : ill. ; 29 cm. Includes bibliographical references (leaves 257-268). media researcher working in another country. editing, and clarified several data analysis questions. Dr.
slippery slope, but he went along anyway. support and my best friend. and feelings of national identity. correlates with feelings of national identity in Belize. have implications beyond the scope of this research. clash with a very pervasive foreign television system. that mass media can lend legitimacy to government. country whose main industries were timber and sugar cane. local stations to report on the event. from 10 to 35 channels in most other parts of the country. and read a variety of heavily political weekly newspapers. association with national identity in Belize. Perhaps the mere presence and popularity of U.S.
and Belizean nationality, summed up as "national identity." 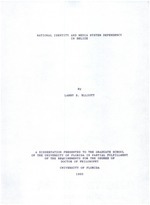 independent nation was working to build a "Belizean"
programming was produced by a foreign country. five years (Lent, 1989). Satellite rebroadcasts of U.S.
American broadcasting system serving up U.S. television. local culture of Belize. Within a dozen years of U.S.
some questions this research is designed to answer. charismatic Price evoked a "Central American destiny"
Party (UDP) of current Prime Minister Manuel Esquivel. would promote what he saw as the public good. Belize in English, Spanish, and Creole. Mexico, although Belizean material is beginning to be used. personal communication, January 18, 1995). these newscasts cannot be received in all parts of Belize. identity" or cultural identity with another country. suffers from high unemployment among young people. zenith of the Republic (p. 35). national traditions in the 1990s (Weaver, 1995, p. 64). national identity have been heard for many years in Belize. media use on feelings of national identity. leaders in developing nations would like to have answered. States (Auletta, 1993; Foote, 1993). were their favorite radio sources (Elliott, 1992). people's positive feelings about their country. between black and white people in the American South. U.S.
emphasized present day U.S. racial conflicts. in these countries, including the United States. review of literature that follows this chapter. lines of Radio Belize had all but ceased to exist. a poor network of roads that made internal travel difficult. at the time of Belizean independence. 1964, followed by independence 17 years later. prime minister is the leader of the majority party. area where democracies have a somewhat checkered history. Belize presents a picture of stability (Fernandez, 1989). include the relative freedom of Belizean mass media. function within the libertarian press tradition. conditions were somewhat better ($3,600 annual GDP). the south in nearby Honduras ($1,090 annual GDP). Factbook, 1994; Europa World Year Book, 1994). but citizens had access to several privately owned weeklies. strongly anti-colonial policies (Oliveira, 1990). early newspapers during the American colonial period. voice, they function as checks on the party in power. riding the Beasts of the People" (Unger, 1992, p. 108). Marion Ali" ("Speaker assaults," 1995). cabinet and the opening of the 1995 Supreme Court session. at a time without seeing a foreign newspaper. coverage of international events was very limited. because of the cost of the service (Oliveira, 1990). number of journalists and other interested subscribers. another country during a typical week. ignored newspapers and magazines altogether. popular songs to reggae selections. multicultural flavor to its schedule (Oliveira, 1990). information, local news, and public affairs. for its news and actualities about international events. 1990; Patrick Jones, personal communication, June 26, 1995). distinctly local tone in its newscasts. split into "Friends FM" and "Radio One" on the AM band. Central American and Caribbean accents for a more "local"
disappearing in the age of global communication. Belizeans who grew up listening to Radio Belize. Table 1. Belize Radio Stations--1995.
continued to dominate radio broadcasting in Belize. Belizeans and mailing them a selection of tapes from Miami. ($2,000 U.S.) for a lifetime of television (Brogdon, 1986). involved only a few wealthy families (Lent, 1989). saw a practical reason to invest in televisions. in prison (Broadcasting and Television Act, 1983). imported television from the United States. television station, which might cost $1 million to launch. Radio Belize seems likely to appear. for several years by the time they were licensed in 1986.
production had made great strides since the arrival of U.S.
Table 2. Belize Television Stations--1995.
an increased local television presence in years to come. We keep in pretty close touch with the community. a year to reach a nationwide audience. also have a goal of serving as a watchdog over government. limited circulation. One is published by the government. function in a developing country. affairs, with little news of international events. still a weak national voice. the basis for this research study. studies of media influence and effects. development and media development simultaneously. national identity is communicated within a country. a new nation must learn in some way "who we are now." sense of national identity develops from that dialogue. communication from within and from outside national borders. nationalism through a communications system of "apertures"
Insulators block out messages, ideas, and people. of people, products, or ideas. ethnicity can divide and insulate groups within a nation. their language and many ancient customs into the space age. be applied to the arrival of Belizean independence. relations until 1991 (Europa World Year Book, 1994). America "in only a geographic sense" (Bolland, 1986, p. xi). what the new nation was all about. requires an operational definition of national identity. by any particular ethnic group. defining national identity in Belize. an identification by others that a certain nation exists. Belize was not forged in a revolution won by force of arms. and cultural traditions (Heusner, 1987). aspiration, response and action" (Constantino, 1978, p. 25). 1. Subjection to a common government. 2. The growth of a single communications network. 4. A single common language used by government. pattern brought to bear on all people. psychological journey toward unity clearly is incomplete. create unhappiness at home (Brogdon, 1986). improving communication and language skills. system to spread throughout the country. but all receive some government support. religion and its psychological and moral characteristics"
identity because mass media can promote a national language. leave Belize to seek a degree in their chosen field. continued, television entered a period of expansion. an important cultural structure in Belise. satellite broadcasting, but effective action was not taken. achieve and prioritize an assortment of individual needs. additional needs for self-esteem and self-actualization. opportunities, and their potential place in the world. For many Belizeans, deciding what "being Belizean"
citizens, were living in the United States (Barry, 1989). being Belizean means ("Immigration issue," 1987). Have you ever sat down and watch T.V. Well, it has happened to me. get a piece of the pie. getting addicted to watching T.V. cited in Wilk, 1993, p. 229). Americans get "a piece of the pie" on U.S. television. language or observance of cultural customs such as holidays. television programs from neighboring Mexico. Ball-Rokeach & DeFleur, 1976; DeFleur & Ball-Rokeach, 1989). another party" (Ball-Rokeach & DeFleur, 1976, p. 6). complex relationships between media, audiences, and society. young people who found such information useful. individual and societal needs for that medium. behavior came from a single source, the newspaper. information functions that can be very behavior specific. increases as the medium's important functions increase. relevance and utility will prevail. specific media, and the motivations for media use (p. 6). The present study attempts to follow this approach. dependency patterns which may lead to media effects. varying media effects (DeFleur & Ball-Rokeach, 1989, p.
information sources during a single hour. who watches the same program with a goal of "understanding"
heritage, and (4) entertainment (Anderson & Meyer, 1975). classifying viewers as either goal-directed "instrumental"
(DeFleur & Ball-Rokeach, 1989; Rubin & Windahl, 1986). medium and the perceived utility of the message or medium. Belize indicates an audience appreciation for its utility. foreign television filled a local media vacuum. other places through television and other foreign media. systems are used for either information or entertainment. themselves to the society in which they live. person's knowledge, attitudes, or behavior. national borders, giving viewers a window on the world. use English in daily conversation (Tan, Tan, & Tan, 1987). young people around the world. or friends who live in other countries. cultures portrayed on television (McClellan, 1994). may explain correlations between "global" or "national"
broader base for dependency theory conclusions (J.
Straubhaar, personal communication, April 8, 1995). strength" (McQuail, 1987, p. 304). theoretical models involving social unity or fragmentation. traditional behaviors and attitudes (Inkeles, 1969). and about new ways of expressing personal identity. Martin-Barbero, 1988; Odhiambo, 1991; Subervi-Velez, 1986). has sought to ban (Sharma, 1993). studied provide comparisons with the goals of this research. the more they perceived themselves as American. least part of the apparent influence of television. government has acted to limit U.S. television programming. time in Canada in 1994 (Harris, 1994). more likely to act violently during play (Gransberg, 1982). nationality" (Alisky, 1988, p. 216). messages (Singhal & Rogers, 1988). national identity never have been successful in Mexico. on a development journalism model. during the same decade for roughly the same reasons. Surveys in a number of Caribbean nations show that U.S.
the face of exposure to the global television system. American programs have created strong television industries. Globo holds a nightly audience of up to 80 million viewers. will outperform imported content (Luyken, 1991). television and films have much more of an English flavor. television broadcasts are generally perceived as "English"
rather than Scottish (Meech & Kilborn, 1992).